Honey is abundant in Northern Ghana, but many young people use fire to harvest the honey from the bush. This mode of harvesting kills the bees and trees in the process. Once harvested, the honey is processed under very unhygienic conditions, sometimes leaving behind the smell of smoke in the honey. This method of harvesting and processing of the honey (referred to as “bush honey”) reduces the market value by half. 72 Africa is helping local communities in their efforts to harvest honey more sustainably and profitably through our support for the Damongo Beekeepers Association (DABA). Purchase new hives and implement techniques that will allow for the establishment of safer, more effective production of honey. 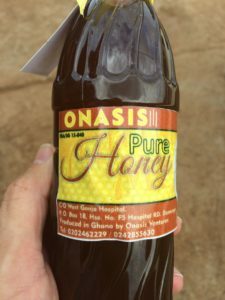 Transition from simply an association to a coop with a vision toward creating a regional enterprise for the production and sale of honey and honey-based products. Assist in setting up marketing and distribution mechanisms that would allow for growth of the enterprise. Train youth in bee keeping and help them procure their own beehives with the aim of assisting them in starting their own businesses; train young people in basic business management and computer skills to further DABA’s ability to sell its products more efficiently and potentially to a broader customer set beyond its region. Our model is structured so that the return on the original investment will allow for purchase of new hives and for the initial training of youth for this enterprise. For $1,000, we were able provide $100 loans to 10 beekeepers for honey and bee wax production. Each farmer agreed to pay $120 back to DABA at the end of the season. This enterprise holds prospects for providing stable employment for a number of youth in the area, as well as a stable economic platform in the region. These efforts create environments where youth, especially, can have purpose and hope, and are much less susceptible to radicalization and violence.